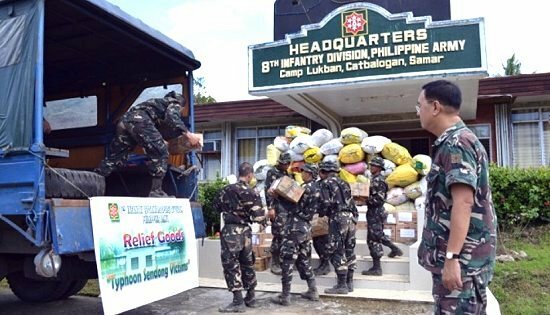 CAMP LUKBAN, Catbalogan City – The 8th Infantry (Stormtroopers) Division has refocused its disaster response effort from the recent incident in Northern Mindanao to the current concern in Central and Eastern Visayas. With the shift in attention, recent efforts to collect relief goods for victims in Northern Mindanao has been stopped to favour the needs of the people in Central and Eastern Visayas. Upon the request on December 27 of the Office of Civil Defense and Local Government Units in Regions 7 and 8, 8ID units performed disaster response efforts together with local PNP units in flooded areas of Cebu and Leyte. The degree of flooding in those areas prompted the NDRRMC to declare them recently as under a state of calamity. The termination of efforts for affected areas in Northern Mindanao brought to a conclusion a week-long coordination to collect and deliver relief goods to the victims of Typhoon “Sendong”. A total of 373 sacks of used clothing, 16 sacks of rice, 20 ½ boxes of assorted canned goods, 22 boxes of noodles, and 4 boxes of mineral water in 500ml bottles have been collected and delivered. “The concerted effort made by the 8ID, local government units and private sectors in Region 8 to help the typhoon victims in Region 10 is a manifestation of “bayanihan” in national scope”, said MGen Chan, Commander of 8ID. TACLOBAN CITY – The Barangay La Perla Health Station at the municipality of Laoang, Northern Samar, which was built under the Kapit-Bisig Laban sa Kahirapan – Comprehensive and Integrated Delivery of Social Services (KALAHI-CIDSS), now serves as a Birthing Clinic, thanks to the public-private partnership. It was learned that the local government of Laoang, through Mayor Madeleine Ong, partnered with the Department of Social Welfare and Development and a private sector KAKAK Foundation through the Mother Bless Clinic, in order to cater to pregnant mothers in this far-lung area in the Region. Mayor Ong informed that the health station was completed early last year while the clinic was set up on November 7 of the same year. The facilities and equipment are provided by the KAKAK Foundation, a privately- owned foundation based in Leyte and supported by the Leyte Governor Carlos Jericho Petilla. Marissa Camero, an on-call midwife assigned at the birthing clinic, said that since its set-up, the Birthing Clinic has served eight expectant mothers who gave birth to eight healthy babies. At the average, at least one birth per week has been attended to from November 7 to December 10, Ms. Camero said. Mayor Madeleine Ong said that the creation of the birthing clinic at Barangay La Perla aims to lower down the risks of, and hopefully to totally prevent mother and child mortality. Mothers and babies die unnecessarily during childbirth because majority of the poorest women in the rural areas do not have access to health facilities and competent health workers and that 50% of the poorest women do not have money to pay a skilled birth attendant. With the Birthing Clinic providing pre-natal, childbirth and post-natal services to pregnant mothers in the area, there is hope that mothers and babies will be provided with life-saving services right at their doorsteps. Laoang is situated in the northeastern part of the province of Northern Samar, it is bounded by the Philippine Sea in the North, in the south by the municipality of Catubig, in the east by the municipality of Palapag; in on the west by the municipality of Pambujan. The municipality of Laoang is composed of 56 barangays, 28 of which are distributed on the northeastern part of Samar mainland while the other 28 are also distributed in the three islands, that is Laoang, Batag and Cahayagan islands. Its poblacion, composing 6 barangays, is on Laoang island which is situated at the estuary of the Catubig river and the Pacific Ocean. TACLOBAN CITY – The skimriders of Tanauan once again emerged as champions in the three divisions of the recently concluded the 8th Tanauan National Skimboarding Open Competition held at the Bantay Dagat Area of Tanauan in the province of Leyte. 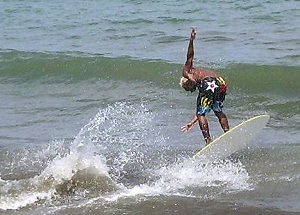 Skimboarding Competition chairman Eugene Ramos said that in the Open category, Tanauan's Brando Espada who is the current title holder was again proclaimed the champion. Coming in as first runner up was Dariel Espada; Obet Yanuario as the 2nd runner up and Rioben Vivero as third runner up. All of them are from Tanauan, Leyte. In the same competition held on December 27 to 30, Tanauan's Inday Ibañez, the reigning champion ably defended her crown and emerged as champion in the Wahini (women's) division. Sicay Ayes of Tacloban City was declared as the second placer. Janice Tapdasan of Cebu was third placer while Clau Las Pinas of Cebu was 4th placer. For the grommet division which is the category for the younger players or beginners, Mebul Pingol of Tanauan was proclaimed the champion. Jake Cartalla of Palo, Joe Cris Lago of Tacloban and Dexter Oguias of Baybay were declared as second, third and fourth placers, respectively. The champion for the Open Category received a trophy and P25,000 in cash while the wahini and grommet champions received P5,000 each. The well participated reggae party which followed the awarding ceremonies in the evening of December 30, was an indication that the skimboarding activity in Tanauan was a success, Mayor Agapito Pagayanan Jr. said. Not one of the more than 100 participants left before the awarding, a clear manifestation that the participants loved and enjoyed the camaraderie at the Skimboarding Area. The skimriders do not only learn to put their energies in the right places, they also develop that sense of responsibility to the sea which is the source of their enjoyment. Thus, the skimmers themselves, see to it that the environment is kept clean and protected. TACLOBAN CITY – The Sangguniang Bayan of the municipality of Abuyog in the province of Leyte, has declared the entire municipality under State of Calamity, the Regional Disaster Risk Reduction and Management Council Operations Center informed. Office of Civil Defense Director Rey Gozon who is also the chairman of the Regional Disaster Risk Reduction and Management Council in Eastern Visayas said that the declaration of the entire municipality under State of Calamity would facilitate the use of DRRM Fund in order to support the affected families, damage to crops and infrastructures. At least 3,485 residents of Abuyog were affected by the December 27 flooding caused by the low pressure area. The flooding caused the evacuation of 697 families and the death of an 80 years old woman due to drowning. The flooding also caused great damage to agriculture and infrastructure, the Abuyog Local Disaster Risk Reduction and Management Council chaired by Mayor Bebot Traya reported. Abuyog which is a first class municipality in the province of Leyte, is the largest coastal town on the eastern coast of the island of Leyte facing Leyte Gulf out in the Pacific Ocean. It is bounded on the north by the town of MacArthur, on the nothwest by the town of Javier, on the south by the town of Silago, Southern Leyte and on the west by the town of Mahaplag. It is bordered on one end by a large river and inland by long mountain ranges covered with dense forests. The town of Abuyog has a mix topographic reliefs. The mountainous area is located in the southern portion of the town and along the boundary of Mahaplag and a little portion at the western part of the town. At the seacoast are flat lowlands where densely populated barangays are located. The town has many rivers and creeks which is potentially a good source of water for the farmers and a drainage system especially the Cadac-an River which has an outlet to the sea and in the north is the Bito River. TACLOBAN CITY – The December 27 flooding in Leyte Island affected 53,446 persons, about 10,669 families in eleven municipalities covering 104 barangays, the Department of Social Welfare and Development in Eastern Visayas informed. The affected municipalities in Leyte include San Miguel with 2,000 families comprising of 10,000 persons in 16 barangays; Alangalang with 300 families or 1500 persons; Abuyog with 697 families or 3,485 in 14 barangays and with 1 dead person; Tanauan with 150 families or 750 persons, one missing and another one injured; Tolosa with 100 families or 500 persons; and Javier with 1,797 families or 8,985 persons. Also affected were 2,422 families or 12,110 persons in the municipality of Mayorga; 130 families or 650 persons in the town of Palo; and 81 families with 506 persons, and 9 totally damaged houses in the municipality of Tabontabon. The most affected town is Dagami with 2,833 families or 14,165 persons in 26 barangays, 1 dead, and 6 injured. Abuyog, Leyte, declared the entire municipality under a State of Calamity to facilitate the use of DRRM Fund to support the affected families, damage to crops and infrastructures. In Southern Leyte, the municipality of Saint Bernard reported 159 families or 795 persons affected. The flooding brought about by the Low Pressure Area caused the evacuation of 3,725 families in the 49 barangays of eleven municipalities, ten from Leyte and 1 from Southern Leyte. As of 8:00 o’clock in the morning of December 29, all evacuees from Palo, Leyte, already returned to their respective houses as flooded areas have already subsided. The evacuees from Saint Bernard, Southern Leyte already returned to their respective houses except those from Barangay Tabontabon. As of 2:00 o’clock in the afternoon of December 29, the Regional Disaster Risk Reduction and Management Council reported that 2 persons died, one person remains missing and 6 persons sustained injuries during the December 27 flooding. Meanwhile the Department of Agriculture reported damage to agriculture but said it is ready to distribute certified seeds to affected farmers. Furthermore, the Department of Public Works and Highways continues to repair roads that were damaged by the flooding. CATBALOGAN CITY, Samar – The government agency in charge of developing the coconut industry is eyeing the organization of a local coconut industry development councils (LCIDC) in the barangays to help them enforce coconut regulation laws and develop the coconut industry more. In today’s PIA radio program “Huruhimangraw ha PIA” Philippine Coconut Authority provincial Manager Emi Acasio urged the local government units to support the organization for the coming year 2012. “If we have gained support from the provincial level, I hope that the municipal and barangay heads will do the same,” Acasio said on air in an appeal of support. Acasio said that he has gained an audience with Samar Governor Sharee Ann Tan who vowed to create the council in the provincial level. There are a hundred thousand hectares of coconut in Samar, and the PCA team composed of 11-strong manpower could only hope that the barangay and municipal councils that will be established can help them. “There is an organized Small Coconut Farmers in every barangay,” said PCA officer Roy Floretes, “But we need a bigger council that can move bigger steps, like the one proposed,” he added. “We need to work together to propel the coconut industry into new heights,” said the PCA officials. PCA said that 75 percent of Samar population rely on coconut. BORONGAN CITY, Eastern Samar – Some 170 slots for registered nurses had been opened to new applicants for the “RN-Heals Program” of the Aquino Administration which is being implemented by the Department of Health (DOH). This was reported by Dr. Jean Egargo, representative of the Department of Health (DOH) for Eastern Samar province. The lady Doctor added that as a continuing program of DOH, these nurses, once they pass the screening, would be deployed to far-flung barangays of the province so they could help the local government unit (LGU) identify the health needs and problems of the people in a particular barangay. Indeed, these nurses do not only deliver health services by administering medicines to patients nor monitor the progress of the patient’s health status, they also conduct a study to find out the root causes of diseases that plague in a community, so said Liezel Pumar, of the Eastern Samar Provincial Hospital (ESPH). “Through a survey which the community nurses would hold, problems like inadequate or poor sanitation, potable water even livelihood would be revealed,” nurse Pumar said in an interview. Economic experts say that among other poverty indicators, health issues should likewise be identified so that local officials would know and make use of the survey results in their decision- making, program-planning and fund allocation agenda. “It is also important that family income is known, because insufficiency of it would be the usual cause of health problems in the family," Pumar added. “When results are ready these are submitted to the local officials for their study,” the health worker concluded. For the 170 vacant positions, a total of 246 have applied for screening process, DOH-Borongan concluded. TACLOBAN CITY – The Eastern Visayas Regional Disaster Risk Reduction and Management Council gave financial assistance in the amount of P10,000 each to the bereaved families of two drowning victims in Leyte. Director Gozon informed that the RDRRMC always give financial assistance to dead victims of calamities in the region. It is so little compared to the pain and sufferings of the bereaved family but it is good enough help to lessen the financial problems, he said. OCD Director Rey Gozon, the RDRRMC chairman, personally presented in the afternoon of December 28, the P10,000 financial assistance to the bereaved family of Jassen Bacate, 5 years old, of Los Martires, Dagami, Leyte. Bacate died of drowning during the massive flooding on December 27. Meanwhile, at 6:00 o’clock in the morning of December 29, Director Gozon delivered the P10,000 financial assistance to the bereaved family of Isabel Matol, 80 years old of Barangay Buntay, Abuyog, Leyte. When her relatives returned home late in the afternoon from the evacuation center, Matol was found dead of drowning in her house. The relatives forgot all about the victim when in frenzy, they left the house at the height of the flooding. Matol was buried at 9:00 o’clock in the morning of December 29. Another victim remains missing, April Jake Eyas, 12 years old male from Barangay San Miguel, Tanauan, Leyte. The victim together with five friends, were crossing the mouth of the Canbatista River to watch the opening of the Skimboarding Competition when strong currents swept the 6 boys away. Five boys were rescued by the rescue team of the municipality. Unfortunately, Eyas was swept by strong currents and has not been found. Director Gozon told the Philippine Information Agency that he has personally requested the Philippine Navy to help in the search and rescue operation for the missing victim. Another two victims survived their ordeal during the flooding in Leyte. Adolfo Pejula, 59 years old, of Barangay Lusad, Dagami, Leyte, nearly got drowned but he was revived. He sustained injuries in his body. Meanwhile, Kevin de Paz, 14 years old male, of San Antonio District, Poblacion, Dagami, Leyte sustained incised wound during the flooding. TACLOBAN CITY – A total of 11,534 bags of Certified Seeds (CS) under the Department of Agriculture’s Seed Buffer Stocking Program are ready for positioning and distribution as assistance to farmers who were affected by the recent flooding in the region, if and when necessary. DA-8 Regional Executive Director Antonio Gerundio informed that due to the heavy rains and flooding that occurred recently, the Department of Agriculture (DA) Regional Field Unit-8 through Regional Executive Director Antonio G. Gerundio ordered immediate monitoring of the situation, particularly the flood-prone areas in the region that may be affected by the continuous rains brought by the low pressure area (LPA). As of 4:00 o’clock in the afternoon of December 27, several barangays in the First District of Leyte, specifically in the Municipalities of Tanauan and Palo were already flooded. Same is true with some areas of Sta. Fe, Alang-alang and Carigara, but the flood subsequently started to subside on the same day. Rice crops in the said municipalities are mostly at seedlings stage and some areas are still on land preparation stage. For the second district of Leyte, several barangays in the municipalities of Mayorga, MacArthur and Dulag were reported flooded. Based on a separate report, as of 11:00 o’clock in the morning of December 28, a total rice area of 565 hectares has been affected which could result to an estimated production loss of about 670.93 metric tons or a money value of P291,092.40. Flooding of rice crops, mostly at seedling or newly transplanted stage was also reported in Kananga, Leyte. Several areas in the municipalities of Abuyog and Javier were also flooded. 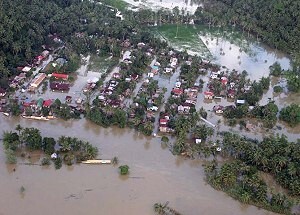 Based on the initial report received, around 200 hectares of rice fields in Abuyog are still submerged in floodwaters. Slight flooding was also observed in some rice areas in the province of Eastern Samar. 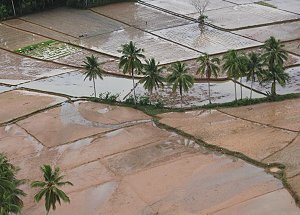 Initial assessment showed negligible damage to rice crops since the floodwaters subsided immediately. The DA-8 office is currently gathering further information from the remaining municipalities and provinces. Agricultural Program Coordinating Officers (APCOs) of the department are conducting field assessment and validation in their respective province/district. Moreover, the office is in constant coordination with the local government units (LGUs) to facilitate initial assessment of damages in crops and livestock, Mr. Francis Rosaroso, chief information officer said.